This piece has a number of intriguing ideas that were circulating in the FORA. Lopez Arango counterposes a static view of unions and anarchism to one inherently grounded in trajectories of struggle, and puts the dynamics of change in struggle at the core of revolutionary work. Though this is only fragmentary, it provides a rare insight into another side of anarchism and unions, and one that gives a refreshing departure from more schematic and purely moralistic or ideological orientations. In a translation of “Pensiero e Volonte” from Rome, an article by Malatesta was published about the relation in theory and fact between anarchism and syndicalism. The aforementioned comrade raised a point of contradiction between those two terms, describes the role of the labor movement and activity of anarchists inside and outside of the unions, and in a final note subtlety gathered words written in La Protesta . The article of Malatesta generalizes a problem not yet sufficiently discussed and clarified. He expresses his point of view that deserves the greatest respect, and despite offering some suggestions to share we don’t rush to pick it up with the only intention of outlining our thesis on the subject. But the note added at the end there of comrade Malatesta, forces us to clarify the value of some words that may have different meaning in Italy and Argentina, as terms now in vogue lend themselves to frequent and unfortunate confusion. 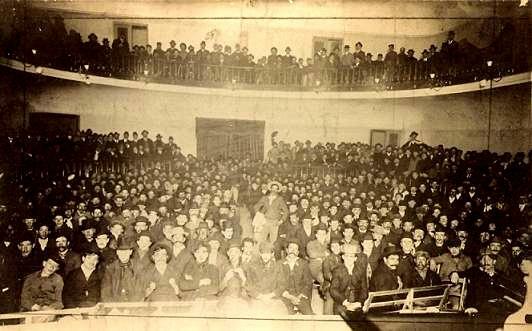 When we refer to the cultural work of political anarchism, we don’t want to say that specific anarchist organizations (like the Italian or French, for example) are limited to making propaganda via the book, pamphlet and newspaper, or capturing adherents with conferences in social centers, ateneos, etc. We also don't want to be guilty of attributing the intention of these militants to wait for all workers to develop before social revolution is possible. Yes, we note the existence of a cultural movement diluted in the environment, imprecise in its form of activity with tendencies of covering all of humanity with ideals of redemption. And we do not believe in the efficacy of that medium, which for it’s own inaccuracy goes unnoticed by the workers themselves. We oppose systematic propaganda in the union and the anarchist objective in the economic organizations that Malatesta and other comrades consider neutral ground in the struggle of tendencies that divide the proletariat. Malatesta concludes that from this interpretation of the labor movement, particularly held by us in this country, our opposition to political anarchism-of party or cultural center- follows and is inspired by the anarcho-syndicalist perspective. That is precisely his error, that anarcho-syndicalism is a combination of the anarchist and syndicalist tendencies, a hybrid product of this confusing period. In that grammatical compound is disguised the old reformist tendency applied to the labor movement in some way the product of preaching ideological neutrality in the unions. Without wishing to insult the old master, we declare that Malatesta as Fabbri-the theorist of the unity of the classes and of the doctrinal disregard in the workers movement- is closer than we are to anarcho-syndicalism. Words don’t have the same meaning everywhere, especially when new labels are applied to old theories. In Germany, for example, anarcho-syndicalism is a new form of expression: it is, according to Rocker, the fundamental revolutionary tendency, bordering on anarchism, founded after the war in the actions of workers in order to put forward new tactics of struggle and new theoretical conclusions beyond social democracy and to find, therefore, the means of bringing about a collapse of the central organizations of the German proletariat. But in Latin countries, with the libertarian and federalist traditions, where the word anarchy doesn’t scare anyone, what use is there to use an ambiguous label? Defined theoretically, the union of anarchism and syndicalism is not possible, nor even in words. Hence, the only interest of the partisans of doctrinal neutrality are to those called apolitical syndicalists and to those who disentangle their activities on two distinct planes: in the unions as employees, and in the parties as adherents of a particular social or political creed. We are, as we mentioned, very far from that tendency that now is labeled anarcho-syndicalist. We have defined our own situation in the labor movement, not so as to impose our conditions on the workers-for the economic link as Fabbri calls it as indispensible to the success of proletarian organization and avoiding the break down of the unity of the class-, but because we have seen in the unions an efficacious means of propaganda, and that practice of daily struggle demonstrates that it is not possible to train the proletariat from a plane situated outside or above the proletariat itself. Anarcho-syndicalism, aims to be a revolutionary theory situated between reformist syndicalism and ideological anarchism that takes the first means of action, direct or indirect depending on the case, appropriates corporatist practices and their economic formulas, and while adorned with the words of the second, the more suggestive is the empirical. The “compound” is a real potato salad, something that looks appetizing, but ultimately is difficult to digest. Malatesta may charge, and with him all the defenders of political anarchism as well – from specific organizations at the margins of the worker’s movement and in opposition to the electoral parties- that acceptance of the anarchist label in unions implies a tendency of exclusivity, and for reasons already stated they reject it. But this imposition, which already otherwise occurs in all spheres of human activity in spite of our libertarian agitation, is not an act of violence in the labor movement. We do not force the workers of a trade or industry, only for having identical interests as employees, to submit to our organizations. We prefer to unite workers according to their ideas and not only by the bond of class. Hence, we prefer organizing as many trends as divide the proletariat to divisions of improvised corporations on economic bases subjected to rigid discipline. There is nothing more absurd than class unity, fostered by political parties to consolidate their own power over workers. Without participating in these purposes with a false interpretation of the labor movement, according to our view, Malatesta and Fabbri also support this unity, and lead by example by giving up any propaganda for secessionist purposes. In so doing, Malatesta and Fabbri reconcile with their own thinking. They could no longer hold a contradictory position, a falsehood evident in recent years. If they support doctrinal neutrality in unions and class unity as a means of making any action against the bourgeoisie possible, it was not logical at the same time to support the Italian Trade Union produced by a split, as opposed to the proletarian entity the CGT who within her womb contains most of organized labor and plays the role of a neutral space open to all trends ... on condition that the official organization not accept the program of the ruling clique. In reality, it is political anarchism which proposes the conjunction of the two antithetical words “anarcho-syndicalism”, that expresses nothing as a doctrine despite the efforts of certain theorists of ambiguity. Do we need to bring those two words together to describe our activity as militants and demonstrate the orientation of the movement that drives us within the proletarian grouping? We do not hold the ambiguity of those who are anarchists in the party or group, and syndicalists in the union. In the same way we reject subdivisions that select a specialty of propaganda: the antimilitarists, rationalists, the anti-alcoholics, vegetarians, Esperanto, etc., we believe that anarchism is only one in all the infinite variety of revolutionary activities, so we combat all the capricious divisions of the anarchists in the economic camp and in the political arena. And we do not give credence to the allegation those who, to justify their own specialty, declare that other specialties are wrong or dangerous hotbeds of corruption. We are told that the union is reformist in nature. But it is necessary to explain the scope of the word. The conquest of economic improvement, the daily struggle against capitalism, resistance to abuse of power, is this the work of reformers? Do you suppose the desire to create something that is finally enshrined in law, as opposed to future conquests? In the area of wages every conquest is transient, perishable, as it is subject to economic contingencies that capitalists cannot regulate. Consequently, there is no legal reform, but only constant change in the value of the means of exchange and it’s equivalence of the worker’s work, which is measured by the bourgeoisie with its economic bevel. That same defensive action is carried out by political parties in the parliamentary sphere, giving reform in its true expression. And political anarchism, even while repudiating electoral groups and dispensing with the parliament and reformist actions, does nothing to encourage such changes in economic conditions of the people when involved in protests against the high cost of living or while engaging in popular agitation aimed at curbing the exploitation of capitalism. That is the relationship in the economic field between union activity and anarchist propaganda inspired by transient improvements. Everything depends, then, on how that struggle is carried out. The anarchists who are active in the trade unions, if they can act as such and exert effective influence over their fellow workers (will that moral dictatorship also be pernicious?) can prevent many strikes from being resolved in government offices and in the halls of ministries. That single work is a relatively important contribution to fighting faith in the law and the worship of the politics, which are the true foundations of reformism. Any revolutionary propaganda made in a non-revolutionary period is based on immediate goals which can be included in any program of social reforms. But what interests us is not the object pursued by the proletariat in actions and protests, peaceful or violent, but rather the way they express their discontent against the injustices and crimes of capitalism, the state, and the means used to secure their conquests. Is not it absurd to restore equivalence between political action aiming at social reform through protective laws, and the anarchist who favors a strike to win a gain that contradicts the most advanced legislation and is in opposition to the plans of parliamentary reformism? As long as social revolution is not a fact, workers will be forced to defend against capitalism with their specific weapons of struggle: strikes, sabotage, boycotts, etc. That will be reformist work easily exploited by advanced political parties, but the question resides in preventing unions legislating on labor and legalizing the reform which is otherwise not pursued by the defenders of the formula: all power to unions and Marxists disguised using the anarchosyndicalist label . What matters is to discuss whether the unions, as a weapon for defense of the proletariat, can provide a broad scope for the anarchists. We argue yes, and in saying this we rely on the experience of our movement. Within the frames of the F.O.R.A. anarchist propaganda developed unhindered. And that is an achievement more important than all that can be done outside the proletarian sphere, in environments not conducive to the spread of redemptive ideas. If anarchism does not have in the labor movement one of its most logical expressions- the principle base of its revolutionary activity - on what basis can we bring about the triumph of the revolution and anarchy? Malatesta considered that unions could exercise a reformist function, but not that they serve as elements of ideological capacitation of the proletariat. He substantiates as well the necessity of syndicalism as a front against the bourgeoisie, recommending to the anarchists to contribute their energies to the defensive action of the working class. We on the other hand, without attributing to the unions any post-revolutionary functions or economic organizations nor strive to improvise economic organization for the capitalist organs after the liquidation of the present regime, we understand that the union offers to the anarchists an excellent means to propagate their ideas and oppose the prevailing authoritarian tendencies in the workers movement in most countries. This subject lends itself to many other considerations ... But we leave it for another day since this article was already too long. "What interests us is not the object pursued by the proletariat... but rather the way they express their discontent... and the means used to secure their conquests". Indeed , I live in Long Beach , California and many AnCaps have quite frankly been taken in by the psychotic rantings and conspiracy theories of McCarthy , von Mises , Fox News , Rand , Paul , Beck ( Several of whom have actually been forced to tone down some of their rhetoric due to history showing them to be wrong in their defenses of unmitigated Constitutionalism , unmitigated Biblical inerrancy , shilling for the NRA and the Military-Industrial Complex , fallacious science denial and the other maliciously deceitful fear-mongering bourgeois filth who hypocritically rage against the machine but defend its strongarms : The corporations , the bourgeois religious institutions , the Military-Industrial Complex ) . More FORA stuff in English has been on my wishlist for years: thanks!